Wichita State and UC Irvine weren't garnering a lot of respect about this time last week as the Shockers were being frowned upon as the final of sixteen host site selections, while the Anteaters were assumed to be just a small bump in the road for Texas in the Round Rock Regional. And while WSU did stumble in their postseason opener, they bounced back to win at home and earn the right to host UCI this weekend, a team that beat the homestanding Longhorns twice last weekend to advance to this point. Though it may not be one of the more glamarous Super Regionals on this year's slate, it certainly is one of the more evenly matched series of the weekend. Eck Stadium will play host to postseason baseball for the second straight weekend. More than 23,000 fans saw the team's four regional games, and if the series were to go three games, seeing a similar attendance figure in one less game this coming weekend would be no surprise. Anteater fans traveling to the midwest will get a look at the famous "Coleman Hill," as well as the recent $7.8 million renovation effort that includes 18 luxurious skyboxes. The ace and opening night guy for the Wichita State staff is Travis Banwart, who has put together a 10-5 record and 2.68 ERA this season. After leaving last weekend's opener early, he came back to pitch (and win) the regional-clinching finale against Arizona. 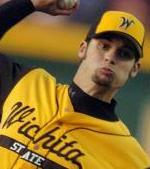 Rob Musgrave, the Shockers' number two pitcher, is not too shabby himself with a 10-2 mark and 2.71 ERA. In the event of a third game, WSU would likely turn to Anthony Capra (7-0, 1.54). For UC Irvine, meanwhile, Wes Etheridge and Scott Gorgen have been tremendous all year long. The former is 12-4 with a 2.68 ERA, while the latter has put together an 11-2 record and 2.91 ERA. In game three last week, the Anteaters went with Eric Pettis (4-0, 3.91). Considering that both squads have tremendous number one and two starters, there's no way to give either a huge advantage coming into the weekend. The Shockers are led by highly-touted junior Damon Sublett, who also pitches on occassion. The infielder leads the team with a .354 average. Senior Derek Schermerhorn, meanwhile, is batting at a .350 clip, while Tyler Weber is the team leader in homeruns with 11. Six players in all are above the .300 mark, but just two of them are above .333. UC Irvine is led at the plate by Ollie Linton, a 5'8" 160 pound sophomore who hits .370 on the year. Six additional Anteaters are at or above the .333 mark, including team homerun leader Cody Cipriano. Though neither team hits for a great deal of power, Irvine's quality sticks give them a bit of an edge over the homestanding Shockers. Noah Krol is the man WSU looks to when it's time to shut things down. On the year, he's 2-2 with a 2.18 ERA and 12 saves. Though he's pitched just 33 innings, he has struck out 47 batters. Noah Booth (6-1, 1.23), Kyle Touchatt (2-1, 2.22), and Jared Simon (0-2, 4.28) have also seen a fair number of innings this season. The unquestioned leader for UCI out of the pen is Blair Erickson. The senior is one of the nation's best relief pitchers, putting together a 2.57 ERA while striking out 28 in 21 innings pitched and picking up 13 saves. Dylan Axelrod is also a quality arm out of the pen for the Anteaters, as is Tom Calahan. Both teams have a shut-down closer they can turn to and decent depth out of the pen, so it's hard to give the nod one way or the other here. Gene Stephenson took over at Wichita State in 1977 when there was no baseball program - literally. Since then, he has transformed the Shockers into an annual postseason contender, and in the process, he became the fastest coach in DI history to pick up 1200 wins. Along the way, he has earned numerous conference titles, regional championships, College World Series appearances, and the elusive national title in 1989. The Anteaters, meanwhile, are led by third-year head man Dave Serrano. After an impressive run as an assitant coach, including a national title at Cal State-Fullerton, Serrano has set the bar high for an up-and-coming UCI program. While he is indeed making waves in college baseball on the west coast, you have to give the experience edge to Stephenson and the Shockers. Any team who goes into Texas and sweeps through regional play has proven something, and that's exactly what UC Irvine did a week ago. The Anteaters are sky-high coming into Wichita, but there they will find one of the biggest, most passionate college baseball crowds in the country. The Shockers are also confident, as they were able to rebound to win the regional title at home last week after falling on opening night. There's no reason either team shouldn't feel 100% confident about their hopes this weekend. As mentioned before, this Super matchup won't receive the same national attention as several others, but it is indeed one of the most evenly matched pairings of the eight. The starting pitching from these two teams is stellar, and each has a guy who can come in and shut the door when they take a lead into the final inning. So with that in mind, the winner in Wichita will likely be decided by who has the hot bats. If one team can solve the other's star pitcher early on, they'll likely find themselves in a good position late in the game, allowing them to bring in their stud closer to shut things down.